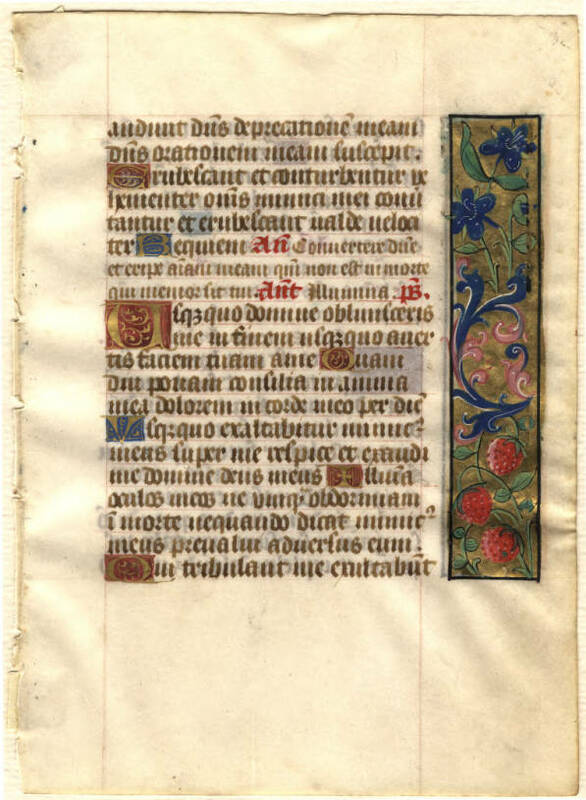 Text: This leaf contains text from the Office for the Dead at Matins, the First Nocturne (Psalms 12 and Job 7). -audivit Dominus deprecationem meam: Dominus orationem meam suscepit. Erubescant, et conturbentur vehementer omnes inimici mei: convertantur, et erubescant valde velociter. Requiem. 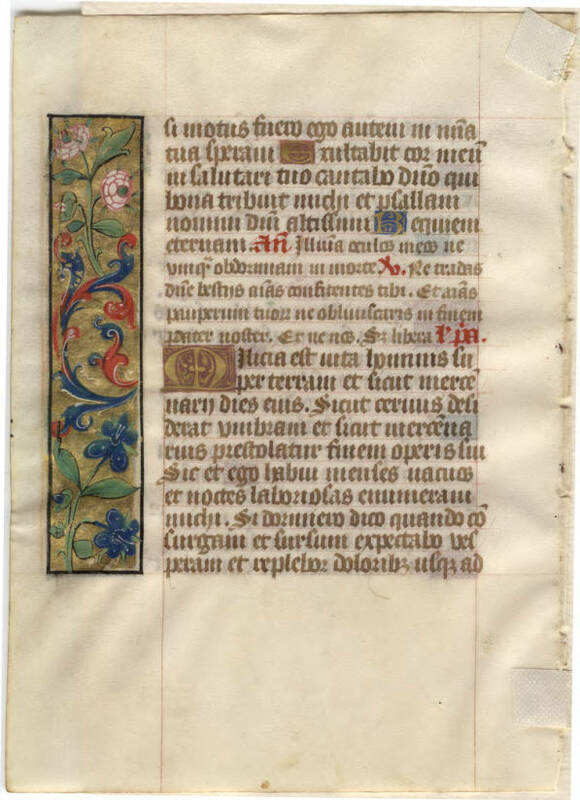 Ant: Convertere Domine, et eripe animam meam: quoniam non est in morte qui memor sit tui. Ant. [ ] Psalmus. Usquequo Domine oblivisceris me in finem usquequo avertis faciem tuam a me. Quamdiu ponam consilia in anima mea dolorem in corde meo per diem. Usquequo exaltabitur inimicus meus super me. Respice exaudi me Domine Deus meus inlumina oculos meos ne umquam obdormiam in mortem. Ego autem in misericordia tua speravi exultabit cor meum in salutari tuo cantabo Domino qui bona tribuit mihi et psallam nomini Domini altissimi. Ant. Inlumina oculos meos ne umquam obdormiam in mortem. V. Ne tradas bestiis animam confitentem tibi animas pauperum tuorum ne obliviscaris in finem. Pater noster. Et ne nos. Sed liberos. Lectio prima. et sicut dies mercenarii dies ejus. et noctes laboriosas enumeravi mihi. Si dormiero, dicam: Quando consurgam? [continuing Psalms 12:] ...when I am moved: 6 but I have trusted in thy mercy. My heart shall rejoice in thy salvation: I will sing to the Lord, who giveth me good things: yea I will sing to the name of the Lord the most high. Ant. Consider, and hear me, O Lord my God. Enlighten my eyes that I never sleep in death. V. Deliver not up to beasts the souls that confess to thee: and forget not to the end the souls of thy poor. Our Father. Lead us not into temptation. But deliver us. [Job 7:1-4] Is not man's life on earth a drudgery? Are not his days those of a hireling? 2 He is a slave who longs for the shade, a hireling who waits for his wages. 3 So I have been assigned months of misery, and troubled nights have been told off for me. 4 If in bed I say, "When shall I arise?" then the night drags on; I am filled with restlessness until the dawn.